Forget doggie day cares, yoga rooms, and resident lounges. Luxury apartment buildings are rolling out movie projectors and popcorn makers this summer to keep residents entertained. 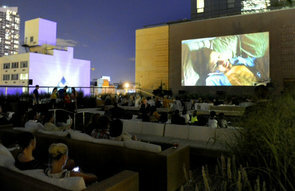 Summer movie screenings range from double features on the communal lawn to makeshift rooftop theaters against the backdrop of the city skyline. Below, a sampling of what residents are watching in rental and condominium complexes across Manhattan. THE SETTING A 10-foot screen is set up on the roof decks of each building, which feature grassy areas and folding chairs seating 85 residents. Popcorn and bottled water are served.